A qualification in Teaching English as a Foreign Language (TEFL), such as the Cambridge Certificate in English Language Teaching to Adults (CELTA) or the Trinity Certificate in Teaching English to Speakers of Other Languages (Cert. TESOL), will give you many opportunities to live and work in the UK and abroad. You will meet people from many different backgrounds and cultures. 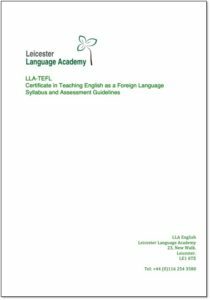 The Leicester Language Academy is one of the few organisations to offer training for English language teachers in Leicester. The Academy offers teacher training for native and near-native speakers of English who wish to become English Language teachers and also for practicing non-native teachers of English who want to improve their language skills and teaching methodologies. To see a copy of our syllabus please click here.